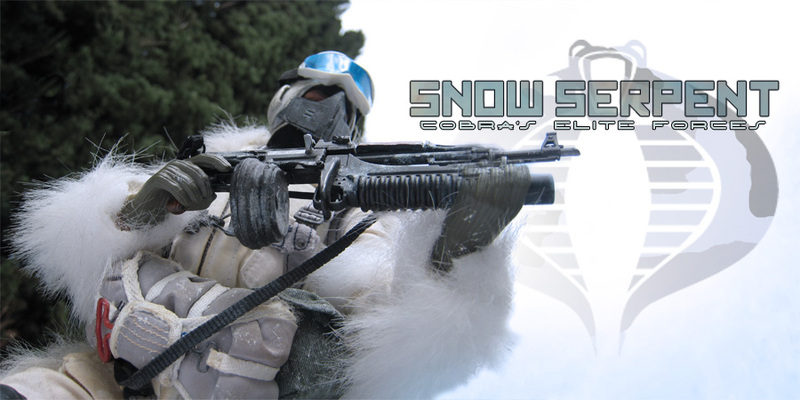 "Snow Serpents are Cobra's arctic specialists, a branch of the already highly-trained Eel (frogmen) division." The Snow Serpent has always been a favorite figure of mine. Though rarely seen on TV or in comics, the design of this character had a lot of attitude. Making this figure took a bit of trial and error, with colors and materials. 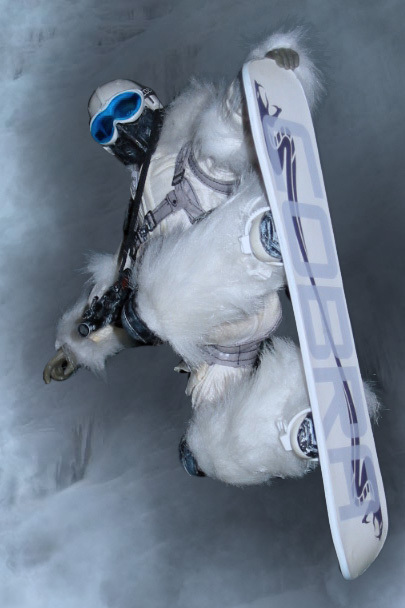 While the Snow Serpent was quite a challenging character to re-create, it was also one of the most rewarding in terms of learning new methods and techniques for customization. Everything cloth with the exception of two ammo pouches was fabricated. 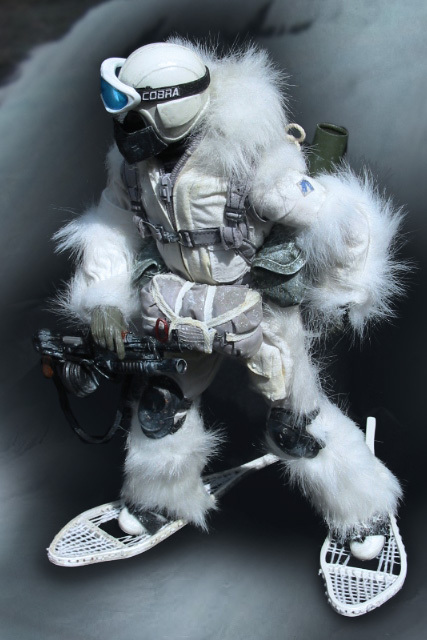 The first version of the 3.75" action figure included a backpack with a mortar/rocket attachment, snow shoes and a reserve parachute. 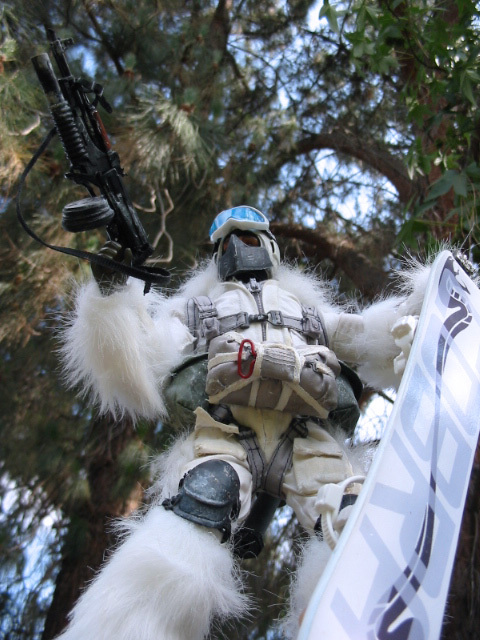 The second version of the GI Joe figure featured a snowboard but also altered the look and feel of the character in a different direction. I wanted to select the good points of each iteration of the character design and include my own ideas with this figure. 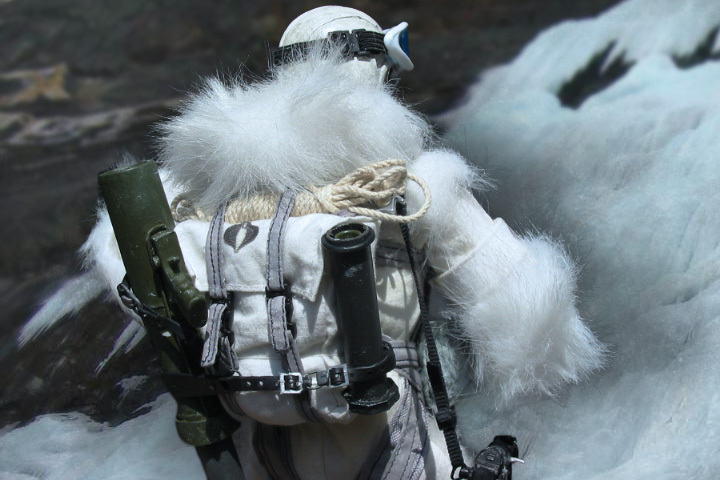 I wanted the color scheme to be a little more functional for an artic environment than the original colors but still be similar enough to where the figure was instantly recognizable. My thinking behind the reserve parachute, a seemingly odd accessory, was its utilization as a wind sail in the tundra as well as emergency shelter material. 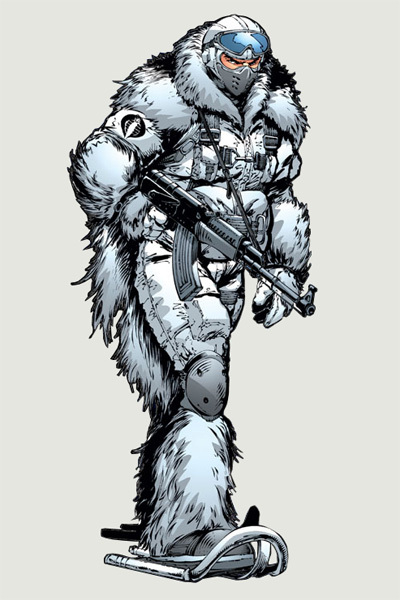 The final straw was seeing the Snow Serpent art in the then new Devil's Due GI Joe: A Real American Hero comic book. 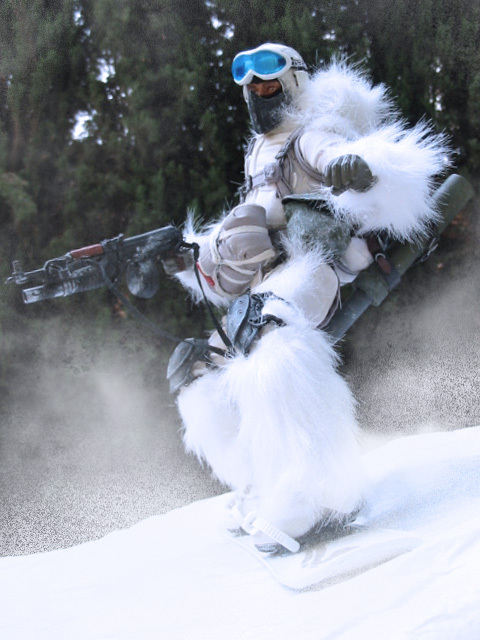 After seeing how well a furry snow suit could work, I knew I wanted to try to make one myself. Above is the original Devil's Due artwork from the comic book which inspired many of the parts I selected for my custom figure. 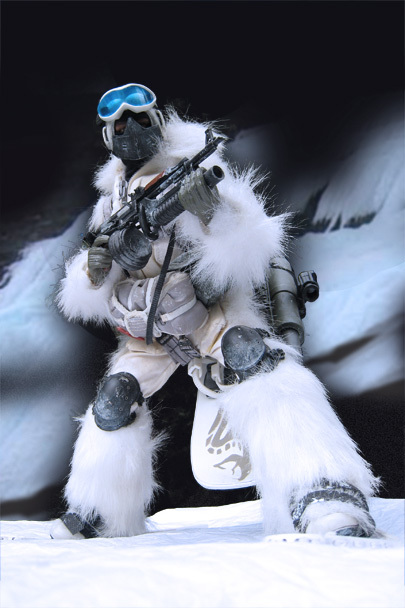 I made several graphics and logos for this figure. Among them, the top half of the snowboard has a double serpent stenciled on and the other half a printed graphic. 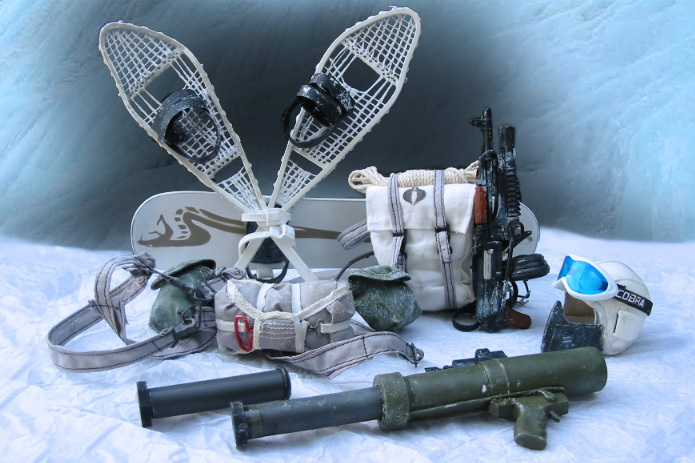 In this picture you can see the Snow Dragon unit armpatch and the Ak-47 drum magazine. G.i. 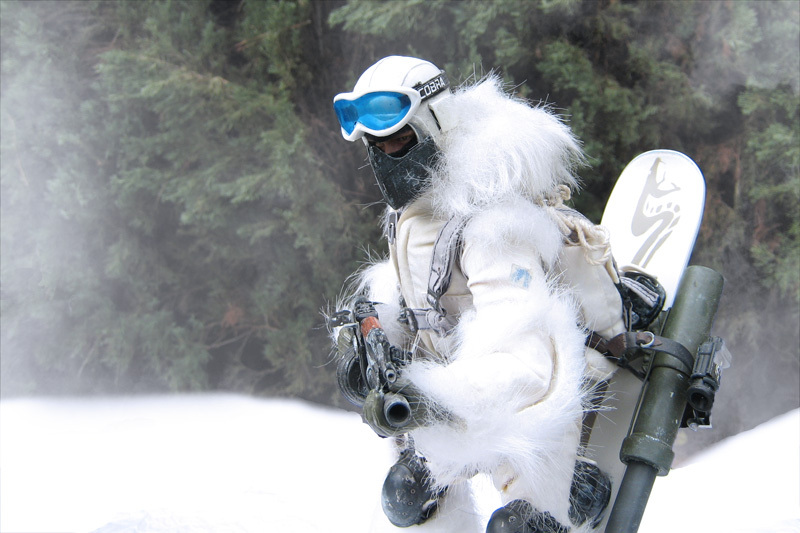 Joe Snow Serpent branch of the Eels Custom Snow Serpent Cobra Range Viper Snow Serpent joe customs Cobra Snow Trooper. 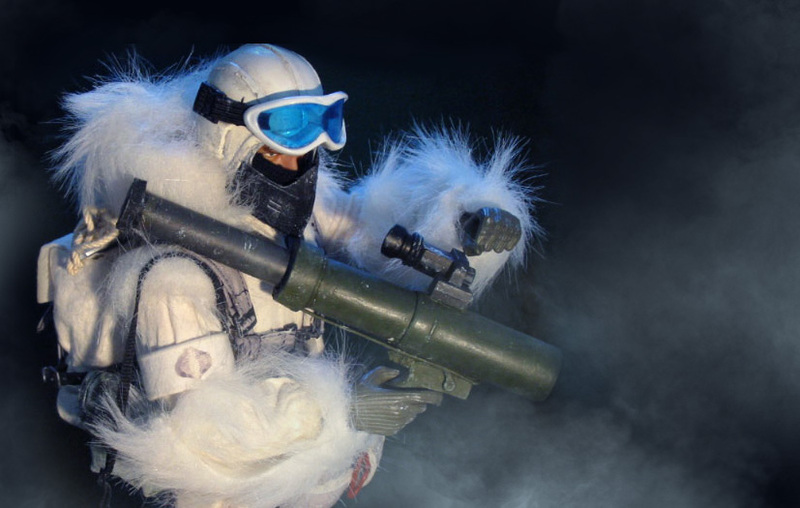 Snow Serpent cobra's elite artic polar troops Get ready for battle with a COBRA polar assault trooper. This fully poseable SNOW SERPENT. 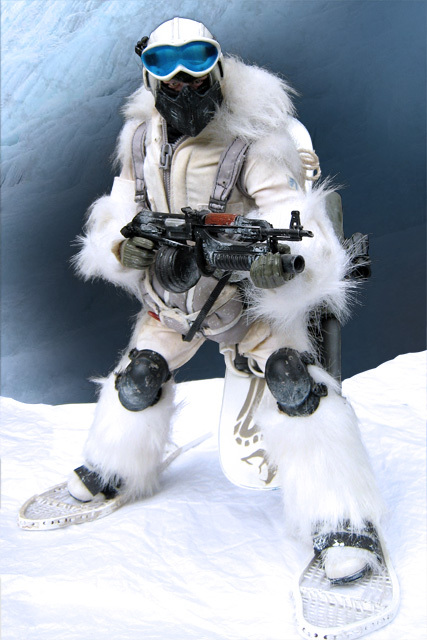 The Cobra Snow Serpent 1985 Version was the leading and one of the best figures in that year. Snow serpent somewhat of an animal in the Sigma Six animated movie Snow serpent cobra snow serpent!